2014: Currently playing Blizzard’s Hearthstone: Heroes of Warcraft. Read about that here. Sometimes, you will get what you want. You have to believe it with open, receiving hands and an open heart. And – you do have to be grateful when you do get what you want. Even if you only get what you want on a rare occasion. That’s something to think about. It is wisdom that applies beyond Facebook games. 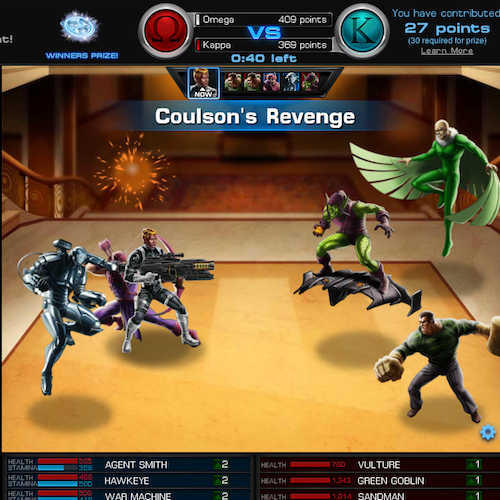 For a limited time, Marvel Avenger Alliance players can get the epic Coulsons Revenge and Isotope Cannon if they play the beta test game on the new gaming platform at Playdom’s website. Beta test game? That means there’s some bugs to be worked out but the game is playable. 3. Click the Redeem button. 6. It can take anywhere from 5 minutes to 72 hours for you to receive your Free Coulsons Revenge and Stark Isotope Cannon. 7. The item will appear in your inventory in the Marvel Avengers Alliance website game – not the Facebook game. Note: Like I said, this is an official promotional offer from Playdom Disney. This is not a Marvel cheat or hack. But who knows when they will ends this promo!